Riojasaurus has been described as being quadrupedal, like Melanorosaurus is (at times it has also been grouped with Melanorosaurus, but now it's usually recovered as more primitive than melanorosaurids). The hand would do a better job of supporting weight than plateosaurid-grade prosauropods, but it's still not made for striding. 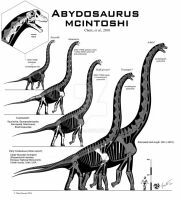 Likewise, though the limbs are indeed closer in size to one another than say Plateosaurus, the relatively straight back and largely immobile shoulder girdles don't support the idea of them moving around on four limbs when they wanted to go anywhere. relating to the comment right below about PULR 56, how much of this skeletal would be the holotype? What do you think of the suggestion that ULR 56 is distinct from Riojasaurus? It's been hinted at a few times in recent prosauropod phylogeny papers such as McPhee and Choiniere 2017. Taking ULR 56 out of Riojasaurus moves the genus up into Sauropodiformes, so maybe ULR 56 is something basal. It would explain a lot about the skull shape. Sorry about the late reply - I think it's entirely possible, but will probably leave it in the skeletal until someone formally refers it to another taxon. Quick question Scott. 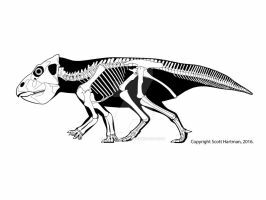 At what point in Sauropodomorph history would you say experimentation with quadrupedalism or falcutative bipedalism began? Weird. I clearly remember that Riojasaurus was quadrupedal. In the '90s Greg Paul normalized portraying almost all prosauropods as quadrupedal. Biomechanics papers suggest that it's actually not terribly common until you get close to saurorpods. 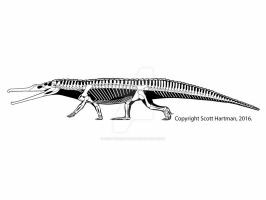 Is the neck just proportionally short or does it have less cervical vertebrae than other primitive sauropodomorphs? It depends on which other primitive sauropodomorphs you are talking about. All sauropodomorphs closer to Plateosaurus than to Panphagia. 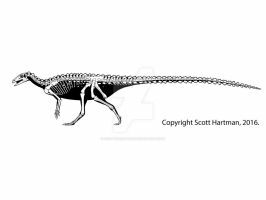 It's not any proportionately than Aardonyx, or even necessarily Sellosaurus (aka P. gracilis), it's mostly just a much more robust neck, which I think helps make the neck appear shorter. 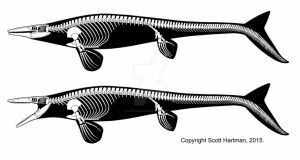 For really long-necked taxa like yunnanosaurs the difference is in the length of the individual cervicals, not in their vertebral count. "Prosauropods" were a pretty widespread group, so it's probably not surprising that we see this sort of variation in response to local differences in selective pressures (feeding, behavioral needs, etc.). Ah, question for you: will there be/is there a paper on this new stance? I'm working as the concept artist for a book which will be featuring as accurate as possible dinosaurs, and the writer wants to have some clarification on the new stance. So there have been a lot of papers looking at prosauropod stance, but not specifically on Riojasaurus. Still, aside from believing in my mad skeelz as a skeletal drawing-er, bipedalism is pretty well bracketed in Riojasaurus. Papers by Bonnan & Senter and later by Mallison showed conclusively that the more primitive Plateosaurus was clearly bipedal, and later papers looking at the more advanced Massospondylus and Adeopapposaurus, and even the quite advanced Aardonyx all show they were bipeds (with the latter making some changes to the hind feet to shift towards graviportalism even before the switch to full-time quadrupedalism!). It doesn't look like you get quadrupeds until you get way up to melanorosaurids at the base of Sauropoda. So what gives with Wikipedia? Well Bonaparte described it as an obligate quadruped originally, and the only two attempts at a skeletal reconstruction since (Peter Galton and Greg Paul) both restored it as a quadruped (though Galton's doesn't look terribly comfortable in the pose). So without an explicit paper Wikipedia's editors presumably just didn't change anything. But from a phylogenetic bracketing case it would be surprising for Riojasaurus to have been quadrupedal (same with Yunnanosaurus, or any of the massospondylids like Lufengosaurus). I see, thanks for the info! I'll be sure to pass it along to my boss. Can you do Zuniceratops, Yi, Dimetrodon, Carnufex, Placerias, Chilesaurus, Pterodaustro, Postosuchus, Tarbosaurus, Ankylosaurus, Euoplocephalus, Quetzalcoatlus sp., and Yutyrannus please? Sorry, I'm not in a position to take requests. The ones I'm currently doing are for two publishing projects I'm working for, and then I will be on skeletal hiatus until the summer so I can work on my dissertation. Though one or two from your list are done and will be released at an appropriate time. 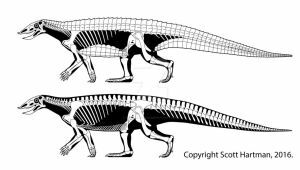 I know what the first one is, is the second one maybe Yutyrannus? Those seventh and eighth cervical vertebrae slightly protruding under the ribs are weird. Another great reconstitution! It's always a pleasure to discover your news technical drawings! Even more interesting, the amount of useful informations you give to each of your skeletons is very reliable! Really interesting to see Riojasaurus shown as a biped. One thing that caught my eye, though, is the scale. 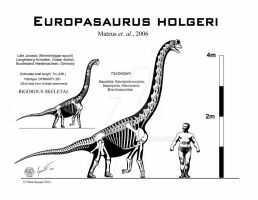 Your scale bar puts this animal at roughly four metres in length, but Greg Paul has Riojasaurus being 6.6 metres long, and Wikipedia claims it could have grown to be roughly ten metres head-to-tail (from Peter Dodson and co.'s The Age of Dinosaurs). Is this size discrepancy due to different interpretations of the same fossils, or is this reconstruction based on material from a smaller individual -- perhaps even a juvenile? I'm not very knowledgeable on basal sauropodomorphs, so I might have missed some literature regarding this issue. Hmmm, maybe I should change that. The deal is that the type specimen, PVL 3808, is around 6.5 meters long. I used that specimen where possible, but it isn't nearly as well described and figured as the hypodigm specimen ULR 56 (which is ~ 4 meters) and I just left the scale bar in from that specimen rather than the PVL one (BTW, I'm 90% sure that Greg used the ULR specimen to fill in the gaps as well, so I don't think that's the cause of any differences). Edit: I did take the scale bar out, I don't want anyone to think I'm shrinking the full length of the animal. Huh. Is ULR 56 a juvenile or did Riojasaurus have a large range of adult sizes? It's presumably a subadult (a juvenile would imply an early ontogenetic stage with greater risk of proportional changes...like if the specimen were 2.5 meters or smaller). Back in the 2000s I decided to try my hand at paleoart using skeletons as a base. 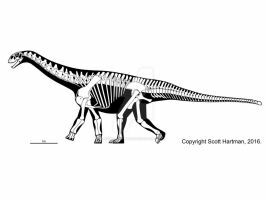 At the time, limited Internet meant that I relied on a book with a picture of a skeleton mount of a prosauropod (Plateosaurus) that seemed to suggest that it was bipedal. 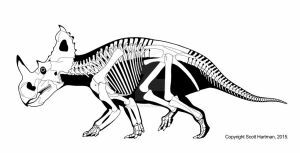 I was genuinely puzzled as to why their full-color reconstruction of Plateosaurus (or every other prosauropod) was quadrupedal in the book I got the skeletals from. The whole "prosauropods are mostly quadrupedal save for the Melanorsaurids and their kin" didn't sink in to me until much later, but it felt vindicating somewhat. This may very well be the only time I've ever seen it restored as a biped and, on that note, what a monstrously powerful looking animal! As far as I know it's the only one. Even though the recent literature has convincingly pushed for bipedalism evolving fairly late in prosauropods, the history of Riojasaurus didn't help with the images - Bonaparte described it as quadrupedal, and Greg Paul illustrated it that way (he seems to think almost all prosauropods were quadrupedal). Peter Galton did a version of it that was quadrupedal, but it doesn't look very comfortable and I wonder if he was running into similar difficulties. Anyhow, you're right: while it doesn't look very swift, you wouldn't want to get into a shoving match with it! Do you have any ideas as to the function of those powerful looking forelimbs and hands? I tend to like the idea that they were scratching up trees for territorial reasons and likely engaged in some intraspecific wrestling mtaches. ...I hadn't thought of scratching up trees and such, but that's a cool idea. Arms are pretty multipurpose, so they could be using them against predators, against rivals, to try and corral unimpressed mates, etc. But it's also possible that the main driver was them spending more time on all fours. Even though their anatomy doesn't support them walking around very far on all fours, they were clearly better at hanging out that way (browsing for food, etc) than earlier prosauropods were, and it may be that making the arms more robust made it easier to adopt a 4 point stance when called for. Somehow I completely neglected the fact that they could likely get down on all fours when need be, that didn't even occur to me. That's what I get for thinking of prosauropod posture as a black and white argument. That bit aside, I agree with all of those ideas and I'll definitely be incorporating them when prosauropod-grade animals make an appearance in my book. I've also considered the idea that they might've been pulling around stones or clumsily excavating burrows when in need of an extra bit of animal protein and calcium. A burrowing cynodont, for instance, would be a perfectly sized snack! Still waiting for published data! Wow. I had always thought that Riojasaurus was a quadruped, it's really surprising to see it on two legs! It's cool to finally have your take on both Riojasaurus and Melanorosaurus as well, to compare. They're not nearly as much alike as I'd always thought. Also, I have to say that this huge pile of new skeletals is has made the last week even better than Christmas!